After several long months with many delays, I have finished my first three MD baby bibs. Check'em out! They're in order of completion from left to right, so that's why the green one turned out the best. :-D But by the time I got to the end, I was getting much better. 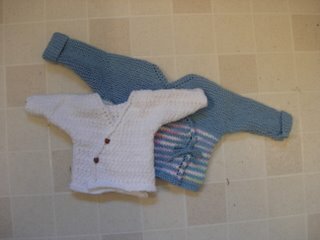 I haven't really done any knitting in about 15 years, so I was quite pleased that they turned out. 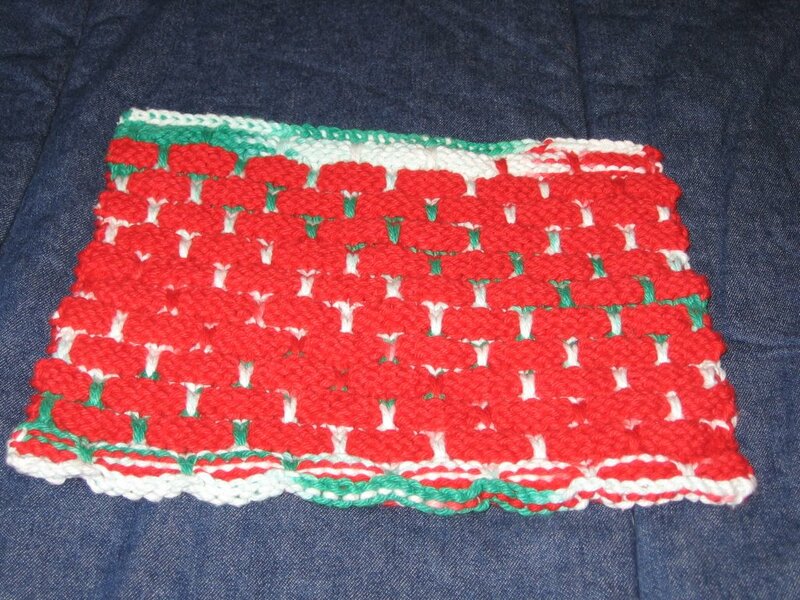 I am knitting the ball band dish cloth.. I just love it. I am using hot pink and hot green.. it is turning out great. I am not a new knitter.. I knit, I crochet, I spin.. I am a fiber nut. I also collect vintage stuff. I love vintagey anything.. This led me to start knitting and crocheting items for my home. Doilies, trims on hankies, dishcloths- lots of dishcloths.. next step cushions.. I am a sahm with 6 children whom I homeschool. life is always busy but I am always working on something. Just got the book and love it.. spent a good deal of time reading it last night rather than knitting the capelet I need to finish.. This is my earthy, chocolate, cafe con leche absorba bath mat with a royal guard of trusty wash clothes by her side. It was a wedding gift for my brother and his beautiful new wife..........back in August. My camera ran out of batteries of the wedding and I forgot I had even taken a picture of the bath mat and wash cloths. Whew! That was a close one. There are now either in Japan or getting there so there is no guarantee I'll ever see these again. 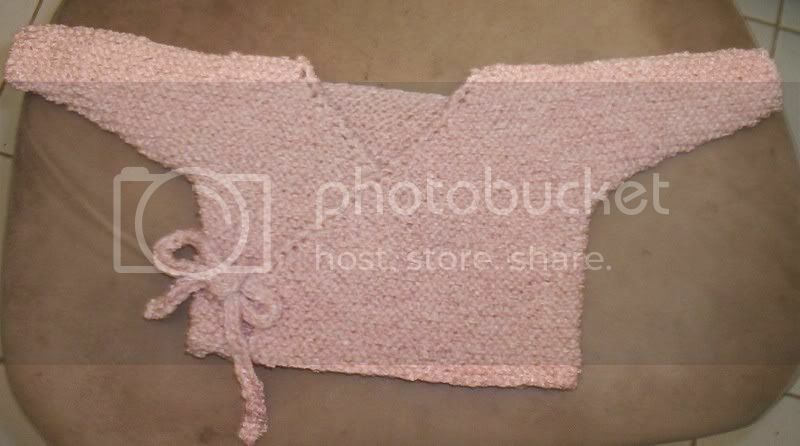 I made this for a friend who just had a baby--a 9 pounder so I made the kimono a little bigger. 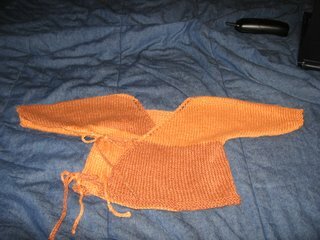 I used size 8 needles and added an inch to the sleeve and length measurements. I started out with 2 balls of pink and 2 of the variegated color, and what I had left is in the bottom right corner. The socks and hat finished the deal! PS I used a long circular needle and did both front sides of the kimono at once (by joining another ball of yarn). I think it went pretty fast that way. Do any of you know where I could figure out about how much yarn I would need to buy to make a certain project? I'm wondering really if there is a computer program, website, equation to figure it out. I know how much there is of the yarn and what the sts per inch are, but I'm not sure how to figure out how many balls I'm going to need, it's for a mitered square blanket project with 20" x 20" squares. Help me PLEASE. Thanks to all ahead of time. 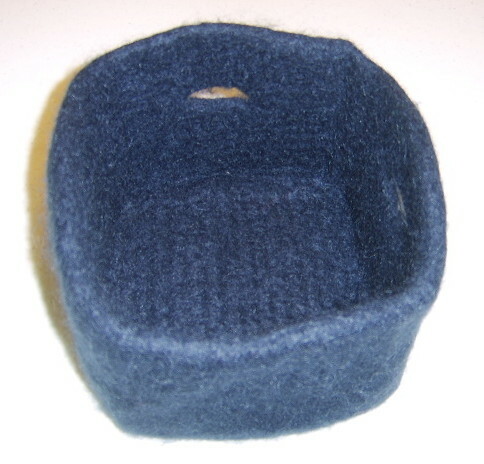 I've completed my first felted box in one of the more common colors, it looks like. Check out the story behind this heirloom wannabe on my blog. 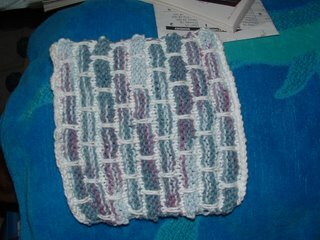 This is my first official ballband washrag, but it's my second attempt. I am a very new knitter and the yb and yf were a little confusing at first. 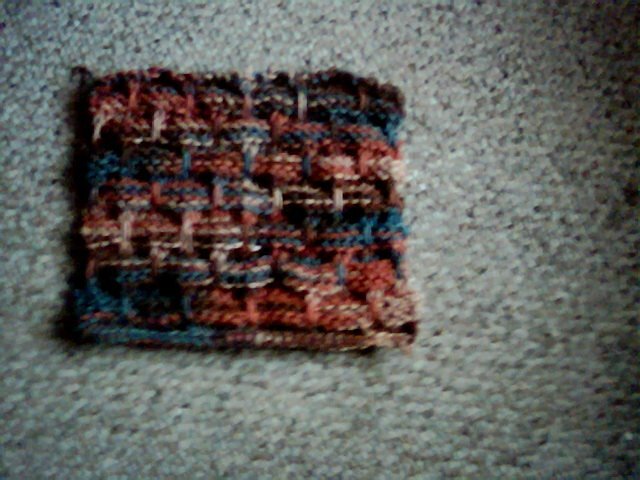 This one is small because I used up a lot of yarn on the first attempt. 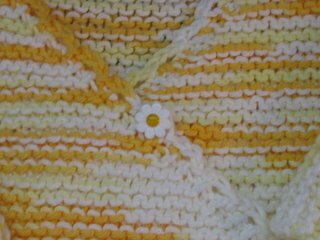 The colors reminded me of a daisy, so I just HAD to get the daisy buttons for it. There's a third one on the inside. Needles: Um. Um. US 7's, I think. I actually finished the knitting on it about a month ago, right before I had surgery, and then I put off the seaming till after I was off the heavy-duty pain meds. 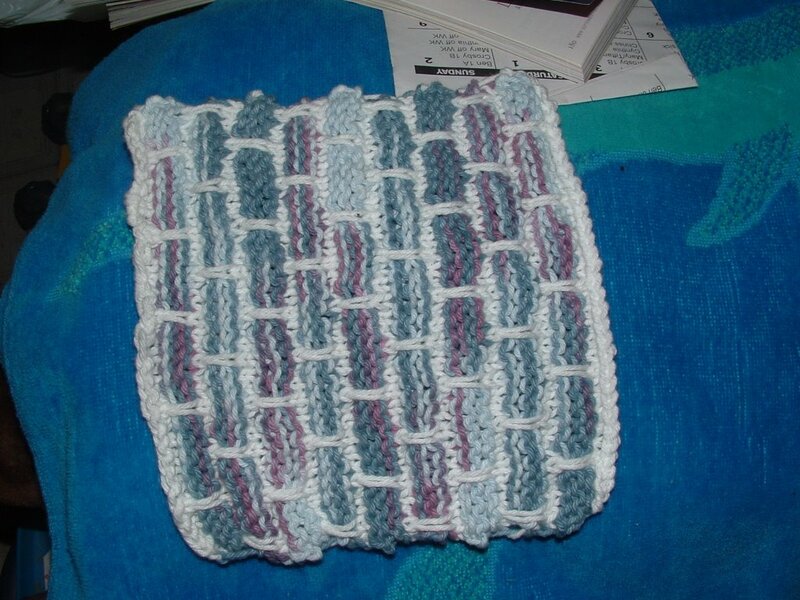 I was making things from the book and posting regularly, I've been busy lately and I haven't had much time for knitting, but I miss sharing with this group so here is my latest ballband washcloth. On the needles; washcloth, MDK handtowel in cotton, Irish Hiking Scarf. Happy Knitting! I made my first felted box this weekend, and I love it, even though it didn't felt very well. 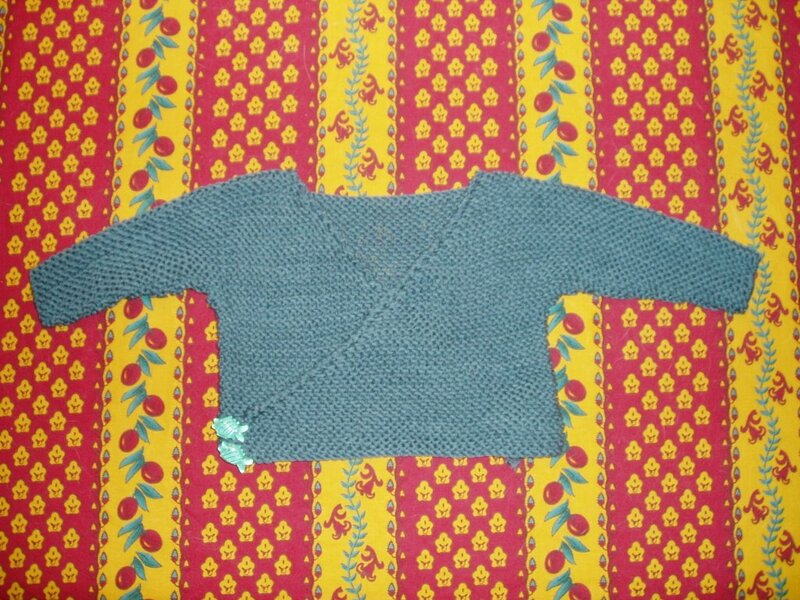 This was the project that made me get the book, since I like the idea of making things other than sweaters. I especially liked the text accompanying the box pattern, where she says sometimes she just rearranges the boxes on the shelf, feeling pleased with herself. That is so me. 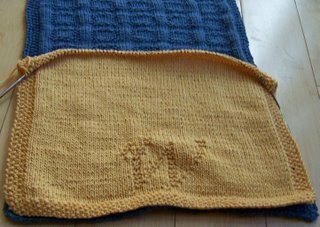 Anyway, I used the recommended yarn and needles, and I washed it twice in hot water (front-loading machine) and it isn't really felted much. You can't see from the picture, but the felting is irregular, with patches that are felted and patches that show the stitches very well. Do I just need to wash it more times? 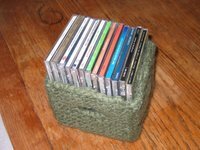 I really like this size box, since it fits CDs so well, but I want to figure out how to uniformly felt things before making a bunch more. Hi, I am a new member, but have been reading the MD KAL for a few weeks. Ever since I got the book, I have been obsessed with knitting all kinds of stuff in it and I zm glad to see what others are up to.I have a question I was hoping could be answered. I would like to try the buttonhole felted bag,but am wondering what could be used instead of Lamb Pride Bulky..does anyone know of a good felting yarn available from the "chain" crafts stores. Like a Lion Brand, or Patons, etc. Also, I noticed a lot of the projects use Louet linen sport weight, I am wondering what a good subsitute would be.Thanks! I went to M.J. Trim recently in NYC to pick up some ribbon for future Baby Kimonos. I asked a manager-type gentleman if he had any tips on keeping the ribbon edges (either grosgrain or satin) from fraying. He told me that most of these ribbons are made out of polyester, which means they can melt, so I should heat up a curling iron and use it to melt the edges of the ribbon until they are sealed. I've been using embroidered cloth ribbon 'til now because I've been wary of the fray, but I think I'll try this tip next time. You guys think it'll work? i'm actually a bit further on this. i only have 2 more rows (or so) and the bind-off, and then i'll be moving onto the other side. Well, make it 6 of 'em because that's number of months it took me to finish! Go ahead and make them strong. I'm just so happy that it's finally done. I'll save all the nasty details for the blog. It didn't seem like it took that long, but the last couple miters really had to be forced off the needles. I'm taken a nice long break, but I need to start another one. Baby size though, I've learned my lesson. No more queen size afghans for a very very long time! And there you go. Fast and easy. Doing both sides makes the earring a bit like a tincy pillow. So one side only might be best. 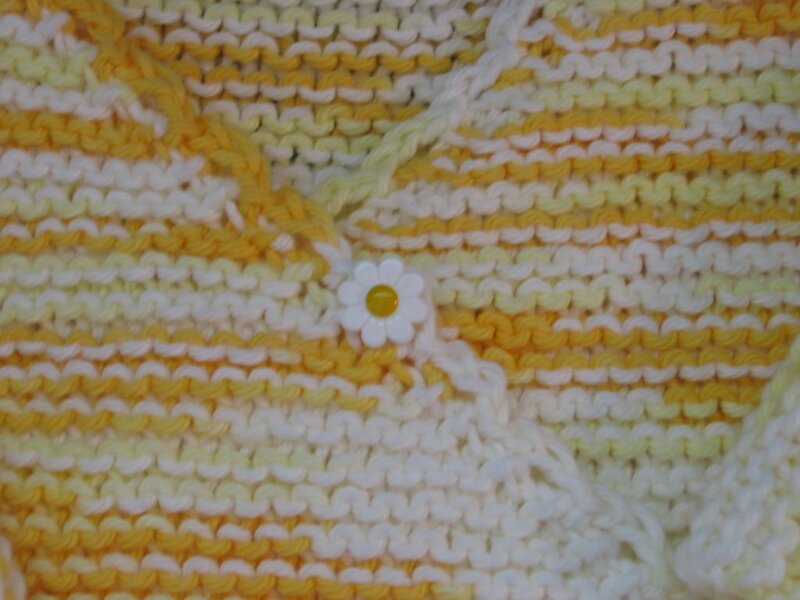 Or doing the reverse side in stockenette stitch. 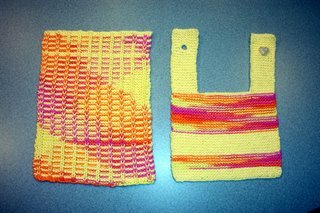 Hi - I'm Joan and new to this blog - have already done 1 M-D knitting project - the ever famous ballband warshrag. It was easy and turned out rather well. 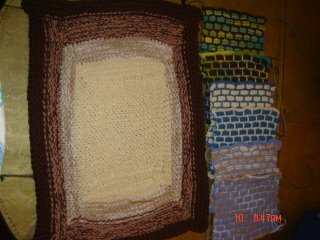 Will post a pic when I'm able - Am now working on a log cabin afghan -and what a lot of fun it is turning out to be! Here's how it's looking so far (please excuse the quality of the photo). I'm enjoying the process as there's very little counting that needs to be done - other than rows. If anyone has suggestions for additional colors, I'm all ears! I haven't had much time for M-D knitting, unfortunately. 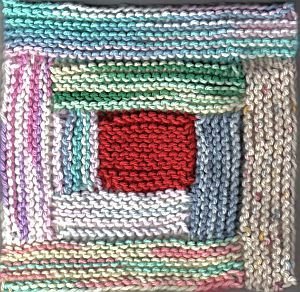 I'm still knitting up mitered squares - and crocheted a few, too, just for fun & ha ha's - and working on a log cabin afghan or two :). 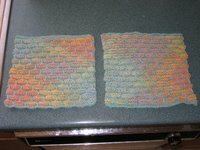 These two dishcloths are the beginning of a pile that I'll be putting together for my church's silent auction Columbus Day weekend. My hometown has a big "Octoberfest" every year - minus any beer, it's more a small country fair, almost, minus the animals but includes the bad entertainment - and the church has a silent auction every year. I haven't donated in quite some time, and realized only this past Sunday that it was coming up. I've been busy knitting/crocheting for my family's raffle, and had blinders on, I guess. 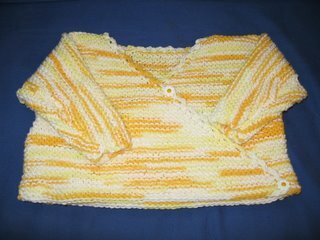 So, what to knit or crochet, in less than 2 weeks time, but will still look impressive - but doesn't involve alot of money, or yarn? 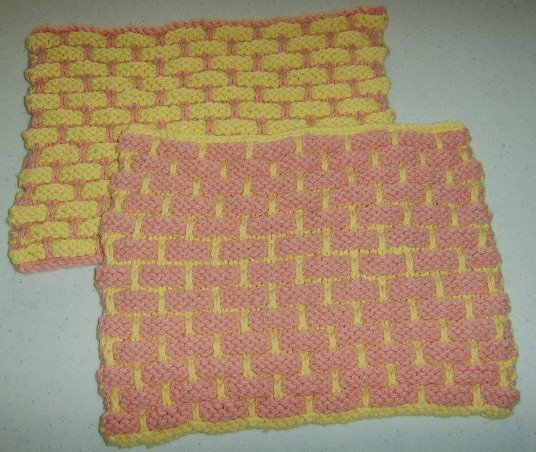 M-D dishcloths, of course, though if I have time, I'll knit one State of MA cloth, since we are in MA after all. 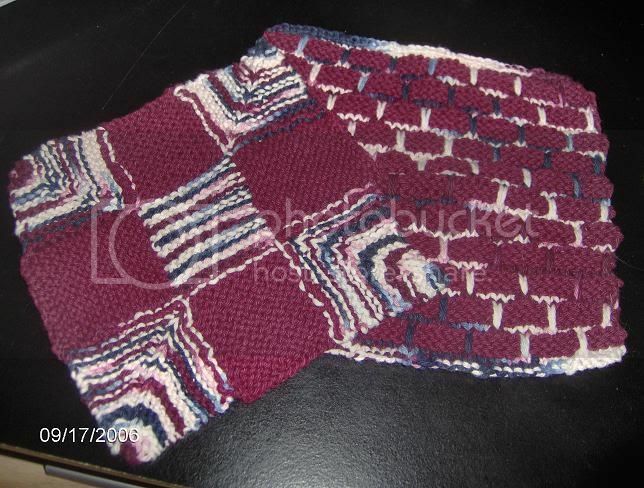 Thanks to hakucho for the pattern! I followed it exactly except for using double strands for the ball band bumps (thicker and more scrubby for the floor) and doing a simple single chain with 2 strands for the drawstring (because I don't know how to crochet!). Next one I make, I'll add an additional row of ball band bumps (making it 7 instead of 6) so it fits the swiffer a bit better. Otherwise, I LOVE it! This one is Brown Sheep Cotton Fleece. On #6 needles it worked up pretty big, so I made the body about 5 inches long. It looks like like it will fit a 6-month old instead of a newborn. I am also working a Hanne Falkenberg kit and have done way too much garter stitch in the last month! While knitting a future ball band seat-belt cozy on the F train this morning, an older woman sitting across from me asked me what I was making and commented to her husband that she liked the colors. I was using two cones of Peaches 'n' Cream and my yarn kept getting tangled. When she got of the train, she came over to me and said that I should use staws before I start next time and then left. I had absolutely no idea what she was talking about until the next time my yarn got tangled. I haven't tried this yet (it was about 10 minutes ago), but I will definitely give it a shot on the next project. Don't know if it will work, but I thought I would share. Thank you nice lady! Update - Am a knittin fiend right now! Having fiber for brains at the moment, I typed my blog url incorrectly! Sorry! Thanks for those who know me (God bless ya!) and alerted me to my faux pas! It is now corrected! I have been knitting warshcloths like crazy. My sister is coming for a visit (more info on that in my blog!) and I want to have some cloths and a couple of towels for her to take back. I am nervous about the visit...so I knit more to achieve peace...while I knit I think about her visit...which makes me more nervous so I knit more...It is a big ol' vicious cycle! I promise I will post pics soon. I just don't know what happened to my kimono. I knit the back to four inches. Checked and rechecked and checked the length again. My gauge was spot on with the book. Then I knit down the first front side. When I got to 40 inches, I measured because the book said "AND" until it was the same length as the back. WELL, my front is 5 inches long! A whole inch longer than the back! So I checked my gauge again to be sure and it is still spot on. I went ahead and bound off and was thinking that before I knit the other side, should I rip this out? Have any of you had this happen? What did you do to fix it? Would you rip back the last inch and have less than 40 stitches? This is my first kimono and I'm pretty frustrated. I used the whole ball of green cotton, and actually had it hanging on the fridge for a week until washing it (and shrinking it) yesterday in the laundry. Last night, as my dearest BF was washing his hands, he looked over and said, "Hey! You finished it!" I agreed, and offered it to him to dry his hands. "How does it work?" I asked. "Works great!" He proclaimed, showing his dry hands. Ah the luxury of the mundane. The green matches my kitchen, and I plan on making more kitchen accessories and tools. 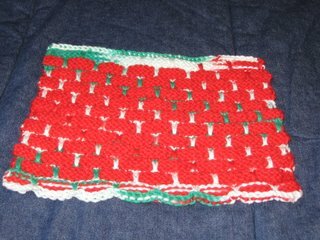 I even inspired my mother (the previous recipient of M-D dishrags) to crochet her own nylon mesh dish scrubby! Here is my second baby set. Used Sugar and Cream. 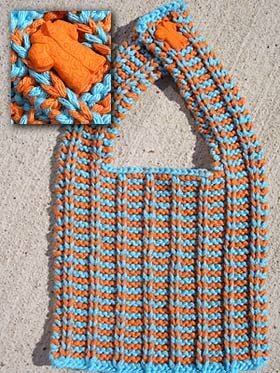 Fibonacci sequence on the bib (A mathematical concept called the Fibonacci sequence is an easy way to get an aesthetically pleasing striped pattern. Here's a portion of the sequence: 0, 1, 1, 2, 3, 5, 8, 13, 21,34, 55, 89 ..). The next project I won't use varigated yarn, I think solid colors would make a stronger impact. 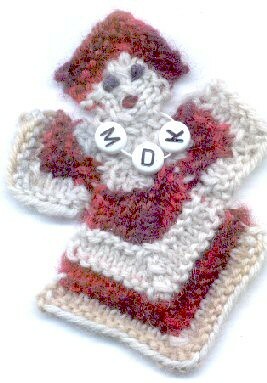 Greetings all you M-D Knitting Fans! I've wanted to participate for quite some time, but Blogger is just not compatible with this old browser, and any updates are not available! I've knit a dozen or more ballbands in the waning months of Summer. They are addictive for countless reasons! I also knit a Log Cabin, and will undoubtedly knit many more - they're wonderfully fun to knit, and the creative possibilities are endless. I used mostly worsted weight yarns from my stash (wool and wool blends): lots and lots of leftovers. This can be a great stashbuster! Click on the NAME of the photo, under the photo to enlarge. Feel free to check out the other knitting folder, too. I hope this is ok to post here but I was wanting to let you all know about another great blog I found that has to do with the book. It is a log cabin KAL. If you are like me and love seeings others work and colors that they used in their log cabins then this is a great site too. I dont know if alot of people have found this yet though cause not many post there very frequently but I do check it every so often to look for new post. I hope you all enjoy it looking through this as much as I do. Hi guys. I finished my baby kimono but have to sew up the seams and get the ribbon for the ties and then I will post a full picture but for now. I scanned this picture of the edging and my edges do not look like the edges in the book. I YO right in the beginning of the row, should I have knit one and then YO. Does it look OK like that. I was going to try a crochet edge to make it less noticable or even weave ribbon through the holes. What is everyone's opinion. Thanks for your help in advance. 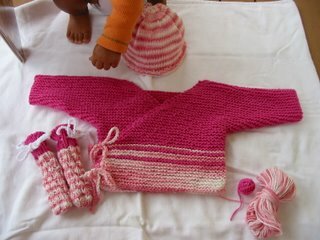 Off white Kimono: Katia Diana yarn. It has 13% angora, but it's machine wash. Again, my gauge was big, so I cast on 34 sts and did one set less of arm increases. I made the body 4.5" long. When I got to the neckline, it looked too small for me; like it would rest too close to the baby's neck, so I yo increased every other RS row, and when I got to the end of the arm cast offs (the part where you work just the body again in the front), I switched to increasing every RS row, but to preserve the yo spacing, I alternated between yo increases and K1F&B increases. This made a sort of scoop V- neck. I have made a small Log Cabin in Peaches and Creme cotton as a sample project. This was perfect for my daughter's American Girl Doll. I want to make a larger one and am not sure how I like the cotton. What other yarns have people used that have worked well? Recomendations? Thanks ladies.....knit on...peace comes with 2 sticks and string. 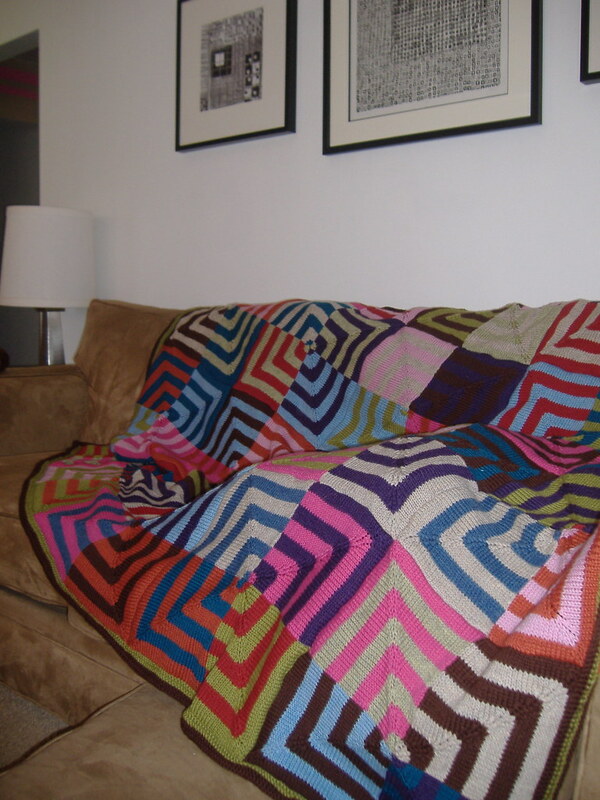 I was wondering what was the largest mitered squares any of you have done, and have you done any looser more afghan like? I want to do a quicker version for the holidays and I have so many projects I can't spend a ton of time on just one, Thanks for anyones advice in advance. Here's the mitered square afghan I made for my daughter to use at daycare. I started this afghan some time ago, using smaller size squares (cast on 48 instead of 72. 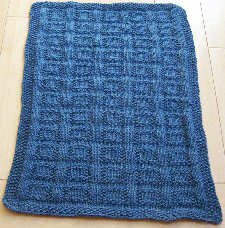 I used Rowan All Seasons Cotton in blues, greens, and pinks. Details can be found here (as well as a picture of my sweet little girl!). I'm still planning a queen sized version using Tahki Cotton Classic, but I need a little break first! I am officially addicted to the Modern Log Cabin baby blankets. Here is the first I completed. I am working on my third! It helps that my friends keep having babies. You can see some progress pictures of the other blankets here, if you wish, and I'll return to post the finished shot of blanket number 2 when I finish it ~ which, even though I'm working on the border, will be a while since I ran out of yarn! 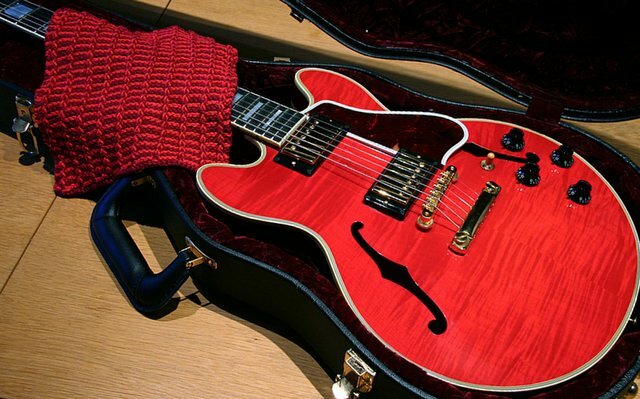 I'm using the Elann Cotton Sonata and LOVE it, even though the cotton is no friend to my fingers. The stitch definition is lovely. It's for a great cause! And it's true, miters really do increase your endorphins. I finally finished Absorba using 2 strands of Gedifra Beauty Cotton in a buttercream colour and an off white and 1 of Takhi Chat print on size 15s, it isn't as wonky as it looks in the photo (though a bit wonky for sure). It knit up pretty quickly when I could work on it (though admittedly not as absorbent as the double worsted P&C would be). I'm happy with it though and it looks great in my odd coloured bathroom. 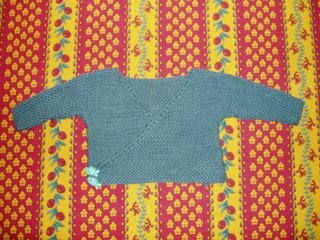 Here's the baby kimono I made as a cardigan. It took less than one skein of Cottontots. Detail on my blog. Having finally finished my first MD project (well, I still have to sew up the kimono, but soon!) I have questions re: the next two things I want to do: first, I'm just starting a Nina shawl (thanks again to the awesome 'lauriec' for providing the missing color so quickly! ), and when I practice the fair isle technique I keep getting tiny holes where the contrast color starts and ends. I've tried all the things I can find in my books and on line, but can't seem to eliminate those holes- any advice? And second, in the book, the border of the Moderne Log Cabin blankets does not look like the mitered border referred to in the instructions. Does anyone know how they're actually finished? I much prefer that narrow border to the other for this application. Thanks everyone- for all the ongoing inspiration and any advice you can share!! You might want to take a peek at their yarn stock!! I was in yesterday and they had Lion Cotton on for $1.99!! I bought all they had - lol, and they said they thought that there still might be more to unpacking or more coming!!!! With great appreciation, I thank you all! Just wanted to thank everyone who helped me put this basket together. It's all ready to go and I couldn't have done it with out you! Your suggestions were great and I think it looks pretty good now. If you're interested you can read more about it in my blog. has anybody else seen this at walmart? is about $5 something. 710 yards. Worsted Weight. not too many colors to choose from but alot of them look like Sugar and Cream. just thought i would let ya'll know just in case you didn't! today was the first time i saw them. I'm making my first Heartbreakingly cute Kimono and am at the part where you first start increasing for the sleeves. I feel like this cast on is really loose and have a lot of holes along the edge. Will these get hidden when I sew it all together? I'm a new knitter and this if my first foray into shaping. Hi, all! Finally getting around to posting a couple of FO's. 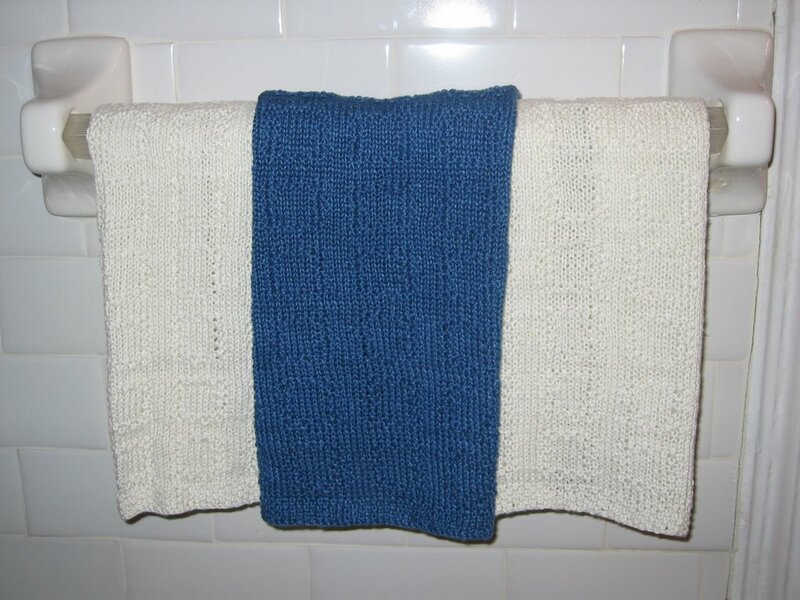 First, the moss grid hand towels, made as a wedding gift in cream and blue Euroflax. Had to drop needle size down to a 3 to get gauge on this. Also did a baby bib o' love for a cousin's new baby. Used some leftover tahki cotton classic, did a seed stitch border, and placed a sailboat motif from design your own kids knits in the center. Found an adorable sailboat button that exactly matches the motif which unfortunately doesn't show up too well in the photo. Thanks for all the inspiration! 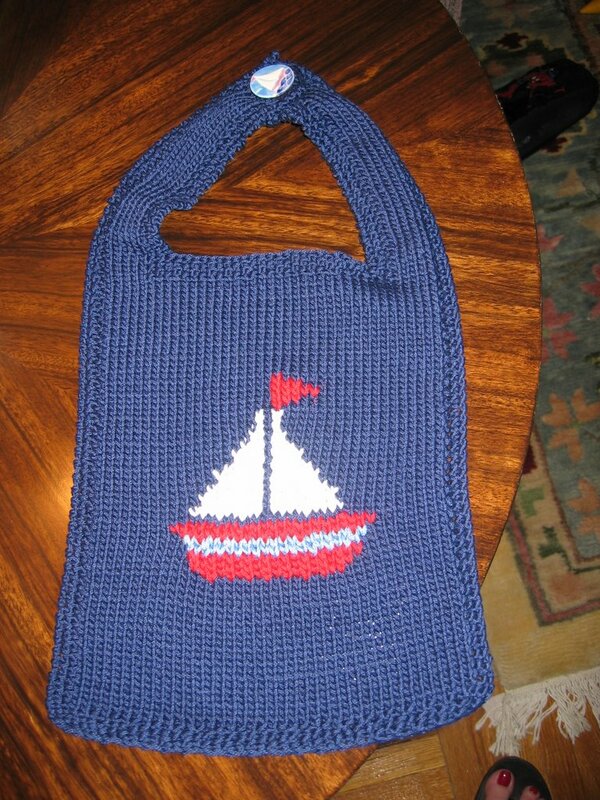 This is my second bib, created for some family friends of ours. My husband's former boss is going to be a dad for the 4th time, and they know that it will be a boy. So, to celebrate, I picked out some bright orange and blue from my stash and set to work. The yarn is Needful Yarns' Kim, which I believe is 55% cotton and 45% acrylic. I've made a ballband cloth from it and after two months of use it's holding up well. The colors are losing their luster but I think it's due to our ridiculously hard water. But it dries quickly so that's a plus. 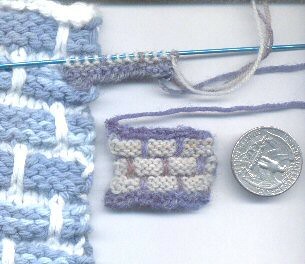 I used US size 5 needles and it helped my slipped stitches to stay tight and uniform. They were getting loose and bunchy with a 6. I get 3 cloths (the 33 stitch size) out of 2 balls so... I guess I'll stop stalking the Hobby Lobby ads for the next $0.99 sale until I knit up a bunch. Guess what everyone is getting for Christmas!!!! Read more about it here at my blog and please check out my Etsy shop! I've got notions bags, and knitting totes on there plus more, and hey - I have to fund the addiction somehow right? OK, now I see why people find these so addicting. This was a lot of fun. I can see making a bunch of these in lots of different colors. The texture is great (and I'm a "sponge" gal, not a "dish cloth" gal). Here are three of the four I've finished... there are currently three others in progress. I keep thinking of new color combos and can't seem to finish one before starting another! I'm having a great time with them. I'm also starting a log cabin blanket, but so far am struggling with picking up stitches. I'm not really a seasoned knitter yet and depend mostly on books and the Internet to learn how to do certain things. I think I might be casting on/binding off too tightly and am trying to work on that (bad habit!). But is there a particular method for picking up stitches? I feel like I'm doing it wrong, considering the amount of difficulty it's giving me. Any tips/good resources would be appreciated! 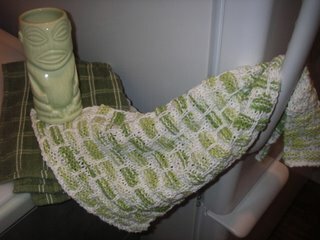 Here's a photo of my attempt on the moss grid hand towel. I really did not enjoy knitting this. I just couldn't find the rhythm to knit it up quickly. It's not made out of Euroflax, it's Plymouth Yarn's Wildflower DK. It's 51% cotton and 49% acrylic. The finished towel is quite lovely. 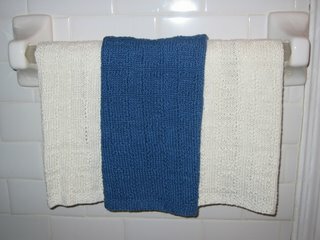 Since one hand towel is just not enough for a gift, I'm knitting a second hand towel - this one based on my own design. 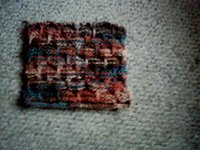 I used the knitting grids found on Sweaterscapes web page and followed the directions there. I printed the aspect ratio that matched my actual knitted gage (in this case, the 1.48). I put the grid back into the printer and printed a W on the page in the Monotype Corsiva font, with a font height of 200. It's important to print it in a different color as you can see the pattern easier. I then approximated the look of the W by highlighting each block. 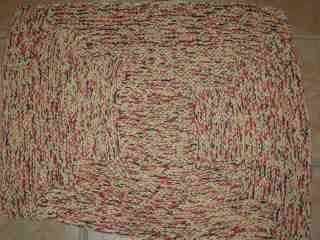 I then took out every other row and knit all the way across on those rows. It just allows the W to pop out (if you don't, then the letter won't really look like a letter). 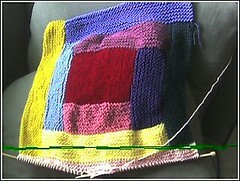 So, on the rows that aren't crossed off, I purl the open squares and knit the colored ones. I'm planning on knitting an upside down W for the other side of the hand towel. 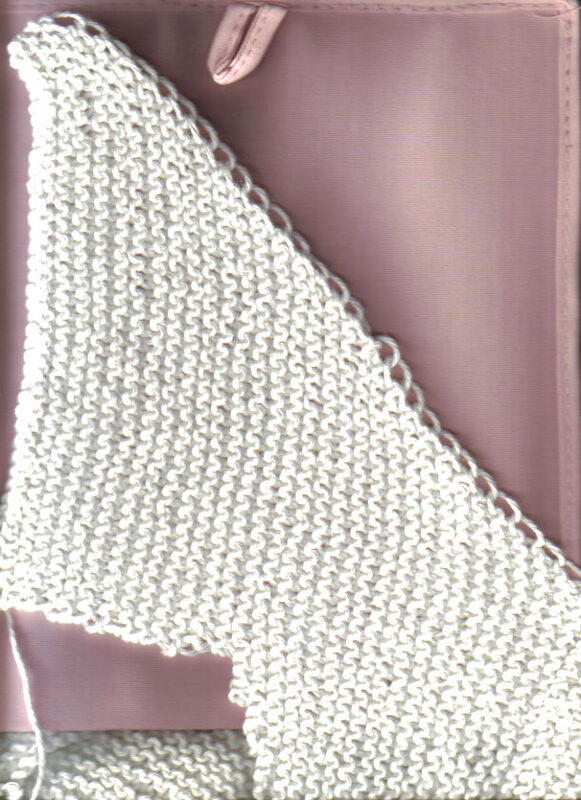 The rest of the towel is plain stockinette stitch. 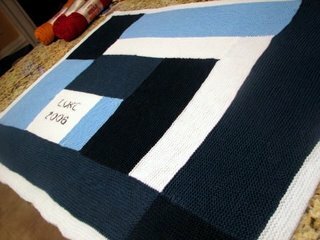 If I were to do this over again, I would have knitted 6 rows before starting the monogram. In this case, I started after knitting 3. 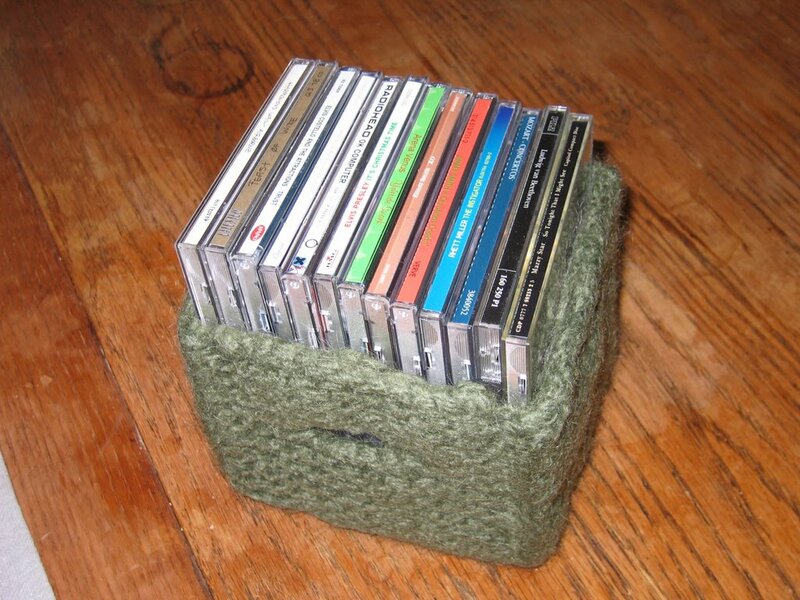 Ballband sweater, someone posted this on the Monthly Dishcloth yahoogroup, it definitely has potential if its not insanely heavy. I may have to make one for my daughter now, she's only 2 so it wont be so big. 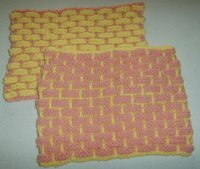 I made some ball band dish cloths over the summer. Pics of 3 are on my blog. Two were give away before the pic was taken. Eveyone loves them. I also made a variation of the moss grid hand towel. I really like it the second time I knitted it. (#1 was ripped out totally) Details of that saga are also on my blog. See July's archives. Later this week I'll get the pic of the kimono up with specs of the modifications I made. I love the MD patterns and have really enjoyed seeing everyone's projects. I'm particularly interested in the log cabin projects since I also quilt. 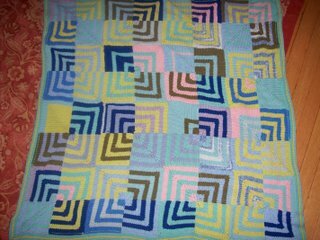 See my blog for my latest quilt in-progress. I recently finished a pair of ball bands and a felted box. 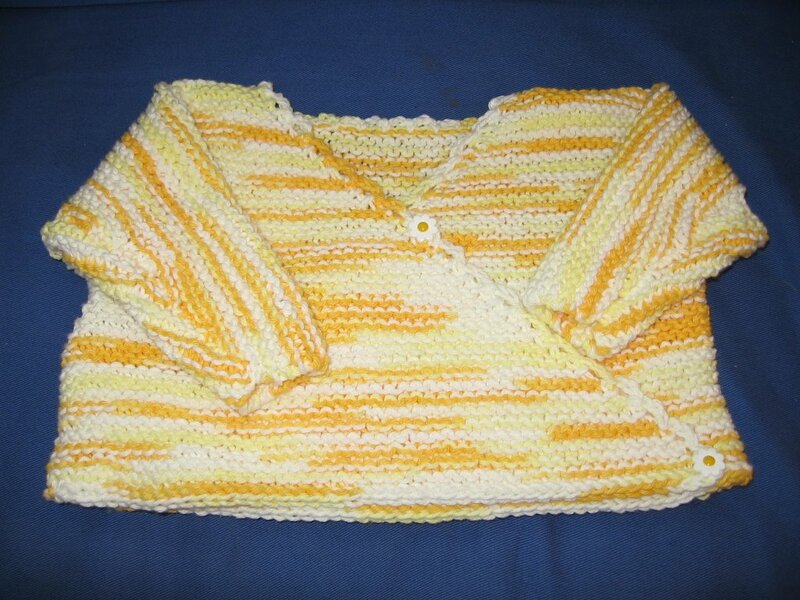 I used Lily Sugar 'n Cream in Tea Rose and Yellow and size 7 Denise Interchangeable needles. Anyone with a kitchen will be getting these for Christmas. I've got a basket full of SnC and can't wait to start coordinating colors for my next pair. 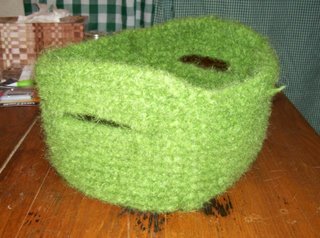 I used Lamb's Pride Bulky as suggested for the felted box. I plan to fill the box with wash cloths, soap, and bath confetti for my niece's birthday. I really love these boxes and am looking forward to making a set for myself, after my Christmas knitting is finished of course! 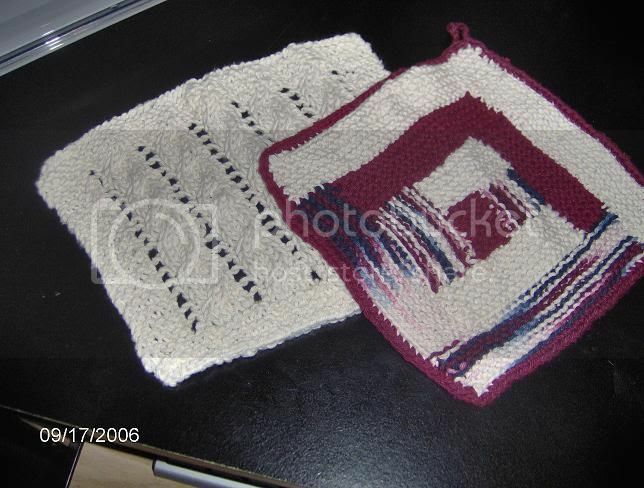 More details on these Mason Dixon projects are available on my blog. Finally I have something to post. I have been following this KAL for a while, enjoying everyone's posts. 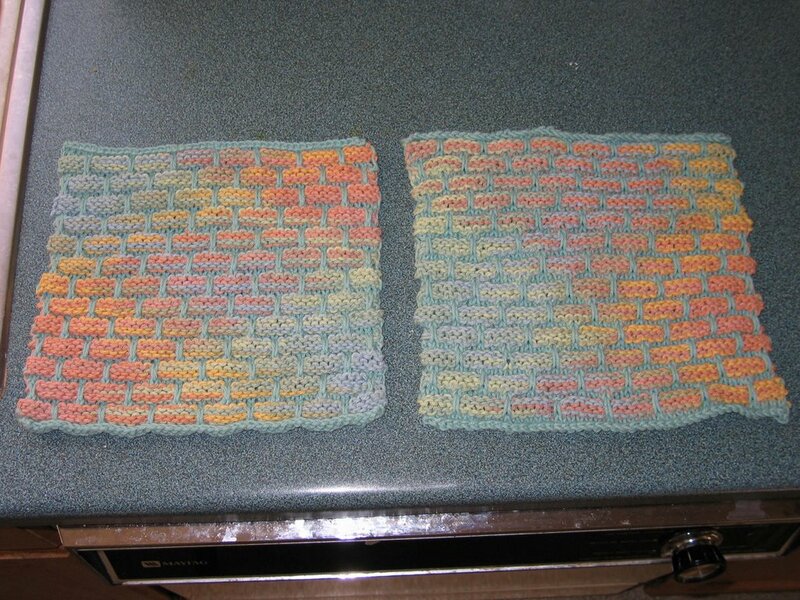 At last, I made myself two dishrags. The one on the right was made with size 7 needles, as recommended. It seemed "loose." 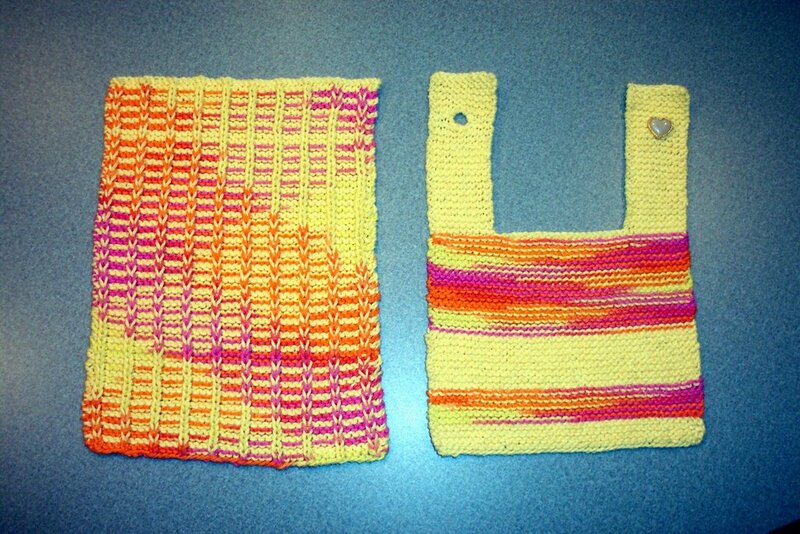 The one on the left was made with size 6 needles. I was surprised that is was so similar in size to the first one, but it is much more dense and springy. I haven't used them yet, to know which version is better in the kitchen. I really like other people's great color combos, but I wanted the cloths to coordinate with the teal (!) countertops in my house (the background in the photo) so I used rather subdued colors. The yarns are S and C and Lion Cotton. I am putting together a small basket for our church's Harvest Festival "Bountiful Baskets" auction for this coming Saturday. 100% of proceeds of the sale of the baskets go to my church, so I want to do a good job on my basket and since they need an estimated value of the basket, I need your help. 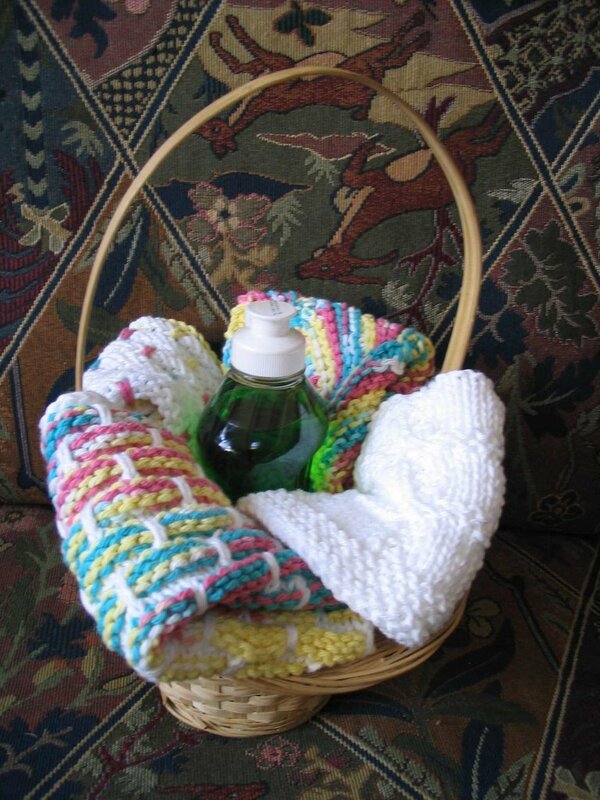 I thought a basket of homemade dishcloths would be a good thing to do. 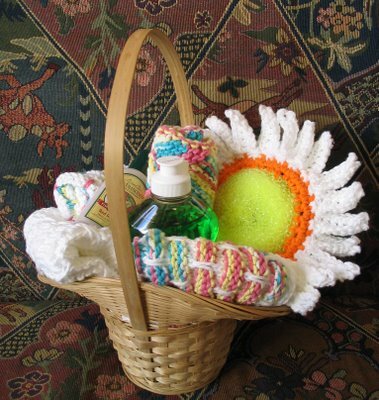 The small basket has two "ball band", one "swish with a twist" and one "garterlac" cloths. I also included a small bottle of dawn dish soap. I'll tie it up in clear wrap before I bring it to the church. Do I have enough in the basket? I would have liked to get some of the pretty soaps, but I have to get the basket to the church by Thursday, so I don't think I could pull that off. Can you think of anything else I could easily get that I could add and what do you think would be good estimate value? Thanks so much to all of you for helping me out on this! 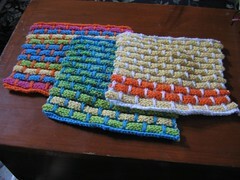 Here are four dish cloth finishes. One isn't from the MDK book, but I was too lazy to take another picture. In on epicture is a log cabin dish cloth. I am so anxious to start an afghan I thought this would be good practice. The one next to it is my first attempt at cables. The other two dish clothes are the nine patch and ballband. I am thinking on making a small felted box for these dish clothes as well. Not sure what color, I have some offwhite I think might look okay. I should be getting my yarn for my log cabin this week!